It’s almost October, and we only have a few short months before the biggest spending holiday of the year. One of the things that I financially prepare for every year is Christmas. Before I started my budgeting journey, Christmas included unplanned gift purchases, Black Friday overspending, and maxed out credit cards. I knew Christmas was going to happen, but I never did anything to prepare for it. The time came to start buying Christmas gifts, and every year I always told myself, “I can just put it on my credit card and pay it off later.” Did I ever pay it off as fast as I thought? Absolutely not. I would wake up the day after Christmas with a massive knot in my stomach knowing that I just racked up all of my credit cards. Instead of enjoying my time off during Christmas break, I was always worrying about how I was going to pay it all off. After successfully budgeting my money for the last seven years, I have learned that planning ahead and creating a savings plan for Christmas is invaluable. Not only does my Christmas budget save me from holiday stress, but it allows me to get through the holiday’s debt free. Today, I am going to share the process that I use to create my Christmas budget so I can come out of the holiday season debt free. I am also going to be giving you access to my FREE Christmas Planning Worksheets! The most important step when creating a Christmas budget is creating a savings plan that allows you to save up enough cash, so you don’t feel tempted to use your credit cards. Most of the time, people start planning out their Christmas budget before they even know how much they can afford to spend. I like to do things the opposite way. Writing out a Christmas budget doesn’t even begin until I have an actual savings plan in place to see how much I can realistically afford within my paycheck budget. I start saving for Christmas in January, but this year I got a late start and started saving with my first paycheck in June. I could afford to save $45 every paycheck; which means I could save $85 every month. Since I started saving at the beginning of June, I would be able to save $510 by November. I like to have my entire savings an entire month before Christmas. This gives me time to plan, to write out the details of my spending on my Christmas budget, and buy gifts. The first step in building a Christmas budget is figuring out how much you can realistically save, and then use that amount to develop your spending plan. I keep all of my saved cash in a Christmas Cash Envelope. When it comes to Christmas, there is a lot to think about. Do you want to make charitable donations to your favorite organizations? Where are you going to have Christmas dinner? Will you be providing the majority of the food? Do you need wrapping supplies? How many Christmas cards will you be giving out? Your Christmas budget is more than just figuring out who you want to give gifts to. You need to think about all of the expected and unexpected costs. The first thing I like to do is sit down and develop a recipient list for Christmas cards. This will allows me to accomplish two different things. One, It will tell me how many cards I need to make so I can get an estimate of how much I need to spend on Christmas cards. Most of the time, I get my cards made through Walmart. I usually do a photo card, but I have found that Walmart’s prices are very affordable. Two, it develops a possible list for Christmas gifts. I use my card list to start the process of writing down who I might want to give presents to. My Christmas Planning Worksheets includes a detailed card list worksheet. Use this worksheet to write down family members, friends, and acquaintances. Did you receive a card last year from someone on your list? Make sure you check the box next to that person so you can remember to send them a card this year. There is also an area to write down their address. This will save you time from scrambling at the last second, searching for updated addresses. I use my Christmas Budget Worksheet to write down all of the details of my spending. This worksheet reminds me to include food, decorations, giving, cards, travel expenses, and other holiday expenses that I need to plan for. Write your total Christmas budget at the top of the worksheet as a reminder of how much you have to spend. For me, these expenses don’t eat up a lot of my budget. I go to my family’s house for dinner and usually spend about $20 bringing an appetizer or dessert. I reuse last year’s decorations, and rarely ever need to buy new ones. So my decoration budget is small. I donate about $20 to a local animal shelter around Christmas, and my Christmas card list is pretty small. I don’t have to travel far, and only spend about $40 on gas. 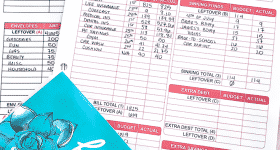 The bulk of my Christmas budget is spent on gifts, but I always like to make sure that every expense is accounted for, and that’s where my Christmas budget worksheet helps a lot. When it comes to my gift budget, I take my total budget number and subtract the expenses from my Christmas Budget Worksheet. Any extra money leftover is used to purchase Christmas gifts. This year, I estimate that I will have about $400 to spend on actual gift purchases. You can use the Card List Worksheet as a starting point for your Gift List Worksheet. I write down all of the people in my life who I would like to buy a gift for. I also go through my contact list on my phone. Once you have listed out all of the people you want to give a gift to, decide how much money you want to spend on each person. For me, I have a pretty short gift list. It includes my son, my boyfriend, a couple of friends, and my family. My family does a gift exchange every month where we pull names from a hat. Each person is assigned one person in the family to buy a gift for. There is a minimum purchase amount of $50, but it makes things a lot easier when I know I only have to buy one present for my entire family. Once I have my entire Gift Budget filled out, I take the spending limit I assigned to each person, and I total up the numbers. Does the total value of my Gift Budget fit within the amount I have left, after I subtracted the other expenses from my Christmas Budget Worksheet? Take your total budget and subtract your Christmas Budget Worksheet total and your Gift Budget total. You should end up under budget by at least $100. That will give you a $100 cushion for unexpected expenses. WHAT HAPPENS IF YOU ARE OVER BUDGET? If I end up over budget, I start to look for areas where I can cut spending. 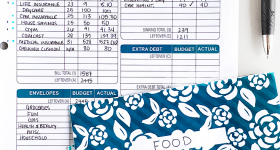 Can you cut food expenses or Christmas card expenses? If you are over budget, never resort to using your credit cards. 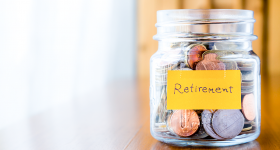 There are things that you can do to stay within your savings amount. Remember that you don’t have to buy an expensive gift for everyone on your list. I like to get creative around Christmas time. Most of the time, I give all of the friends on my list the same thing. For example, last year I made all of my close friends three bars of homemade soap and bought one bottle of lotion from Bath and Body Works. The total cost per person ended up being about $15. If you have a lot of acquaintances (coworkers, teachers, neighbors, etc.) on your list, try thinking about things that you can make in bulk and divide among all of them. You can make a big batch of cookies and spend a little time making the wrapping and presentation special. It’s important to remember, and it’s something that I try to focus on every year, that Christmas is not about what you receive, but rather the memories that you make. The holidays are about being around the people who you love and care about, and that’s the most important gift that you can give. If you would like more information about budgeting, you can read a step-by-step guide on how I budget my money here. Ultimately, your goal during Christmas is to survive debt free. You don’t want the stress and worry of maxed out credit cards hanging over your head during the happiest season of the year. Make sure to head over to the FREE Resource Library to download your Christmas Planning Worksheets! There is no soaking or waiting overnight for this delicious recipe. Cinnamon rolls and apple pie filling make this breakfast a go-to favorite. Enjoy the perfect slice of Baked Apple Cinnamon French Toast topped with brown sugar, nutmeg, and chopped pecans. If you are on a small budget this year, decorating for the holidays can seem impossible. Here are 10 affordable ways to decorate your Christmas tree without breaking the bank. Add a personal touch to your holiday gift wrapping with these Simple Christmas Gift Tags. Wish your friends and loved a Jolly Holiday with these adorable treat bag tags. Great for classroom handouts, a present for the teacher, and stocking stuffers! Sometimes I feel like the mean mom, the mom that is completely depriving my son of joy during Christmas by not giving into his many wants or his ginormous Christmas list. But going into debt, or going on a spending frenzy to get him everything he wants, is just something I can't do. In life, we don't get everything we want. We don't always get to have what everyone else does. It's important that my son knows that. If you are looking to decorate for Christmas on a small budget, then you have come to the right place. We are sharing 11 of our favorite DIY Dollar Store Christmas decorations that anyone can create! I hate how commercialized Christmas has become, and of course that just leads to stress and debt and more stress and AGH! There’s so much pressure to buy the most expensive gifts, and that’s really not necessary at all.